Donald Trump is declaring that Hillary Clinton "is a bigot" in his latest outreach to minority voters. The Republican presidential nominee drew loud cheers from a crowd in Jackson, Mississippi, on Wednesday when he declared that Democrats have taken minorities' support for granted. He said of his Democratic opponent, "Hillary Clinton is a bigot who sees people of color only as votes, not as human beings worthy of a better future." Trump also gave a vague preview of his new immigration policy, which is slated to be unveiled next week. He said any immigration policy he supports must pass three tests: It should improve the wages, safety and quality of life for U.S. citizens. Donald Trump is linking his "movement to take back the country" to Britain's surprising vote to leave the European Union. 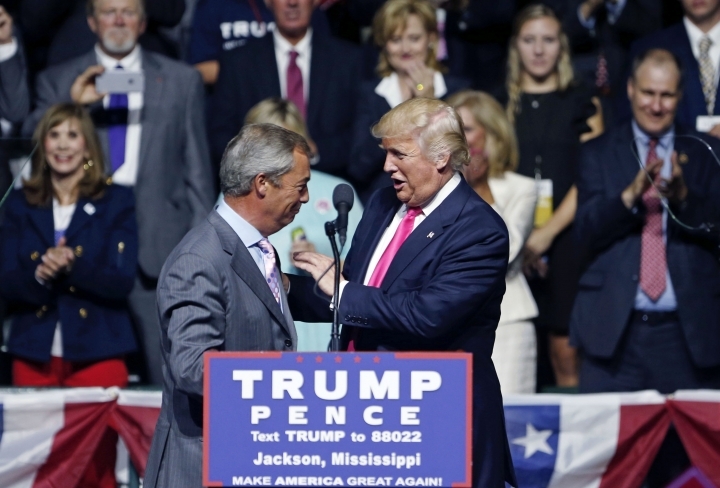 He invited Nigel Farage, an architect of Britain's successful "Brexit" campaign, to join him on stage at a rally Wednesday night in Jackson, Mississippi. Farage is outgoing head of the United Kingdom Independence Party. He said "anything is possible" if enough people band together, and predicted that Trump's presidential campaign would "smash the establishment." Farage noted that his movement was an underdog in public opinion polls but triumphed in Britain's June 23 referendum. He predicted that Trump, who supported Britain's departure from the European Union, would stage a comeback and win in November. Trump called Farage's appearance an honor and said, "The nation's working people will take control again." Donald Trump is continuing to modify his previous pledge to deport the 11 million immigrants in the United States illegally. He says in an interview airing Wednesday that "we work with them." In a Fox News interview taped Tuesday, Trump says there would be "no citizenship" for those immigrants. "They'll pay back taxes," Trump says. He adds, "There's no amnesty, but we work with them." He talked about how hard it would be to deport people who have lived in the country for decades and raised a family. Trump is expected to unveil his new immigration policy next week. Aides have suggested he'll back away from his deportation plan toward one closer to what many of his Republican rivals for the nomination favored. Republican vice presidential candidate Mike Pence has returned to his home state of Indiana after tornadoes struck the state. Indiana's governor, Pence had been campaigning in North Carolina on Wednesday when multiple tornadoes touched down in central Indiana. Initial reports describe a large tornado moving across the Howard County town of Kokomo and damaging apartment buildings and automobiles and cutting power. In a tweet, Pence asks, "Please keep Hoosiers in your prayers." A spokesman for Pence, Matt Lloyd, says the governor had returned Wednesday evening and was heading to the Emergency Operations Center of the Indiana Department of Homeland Security. Kokomo Mayor Greg Goodnight says Pence plans to visit the area on Thursday. Republican vice presidential candidate Mike Pence is turning his attention from campaigning to his home state of Indiana after tornadoes struck the state. Indiana's governor, Pence was campaigning in North Carolina on Wednesday when multiple tornadoes touched down in central Indiana. Initial reports describe a large tornado moving across the Howard County town of Kokomo and damaging apartment buildings and automobiles and cutting power. In a tweet, Pence says he is returning to Indiana and asks, "Please keep Hoosiers in your prayers." The White House is firing back at Sen. Mark Kirk for his comment that President Barack Obama was "acting like the drug dealer in chief" when the administration made a $400 million cash payment to Iran. The Illinois Republican criticized Obama over the payment, which was contingent on the release of American prisoners. Kirk's campaign has said the administration's actions are "almost certain to fund terrorism." White House spokesman Josh Earnest said Wednesday Kirk's rhetoric is inconsistent with how most people in Illinois view Obama's efforts to prevent Iran from getting a nuclear weapon. Earnest says it's tempting for candidates "to say outrageous things to try to get attention," but "that's certainly no way to run a country." Kirk faces a difficult re-election challenge from Democratic Rep. Tammy Duckworth. Donald Trump says the Republican-run Congress should return to session to "approve whatever's necessary" to combat the Zika virus. The GOP presidential candidate tells WFLA television in Tampa, Florida, that Congress "ought to allocate more money to Florida and see if we can nip" the virus "in the bud." Lawmakers left Washington in mid-July until after Labor Day without approving any of the $1.9 billion that President Barack Obama requested in February to develop a vaccine and control mosquitoes that carry the virus. Trump's rival Hillary Clinton has urged Congress to shorten its summer recess and immediately approve Zika funding. Trump is praising Florida's Republican Gov. Rick Scott for "really pitching in" instead of giving up on the problem and hoping "it just goes away." 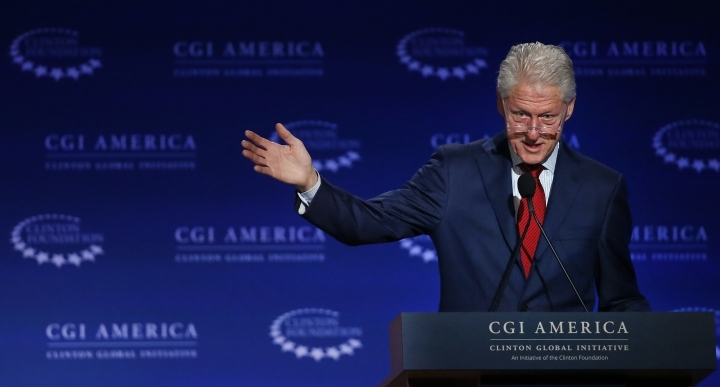 Former President Bill Clinton is defending the work of the Clinton Foundation. Clinton told reporters in Atlanta on Wednesday: "If there's something wrong with creating jobs and saving lives, I don't know what it is." An Associated Press report Tuesday found more than half of the non-government officials who met with Hillary Clinton while she was secretary of state gave money to the foundation. Bill Clinton repeated his plans to stop accepting foreign donations and personally stop raising money for the foundation if Hillary Clinton is elected president. He said those changes can be made quickly after the election but he doesn't want to jeopardize projects or hurt employees. Mike Pence says "pay-to-play politics is over and done" if Donald Trump is elected president. The Republican vice presidential candidate aimed his comments at Hillary Clinton, the Democratic presidential nominee. They came after The Associated Press reported that 85 people from private interests who met with or had phone conversations scheduled with Clinton while she led the State Department donated to her family's Clinton Foundation. 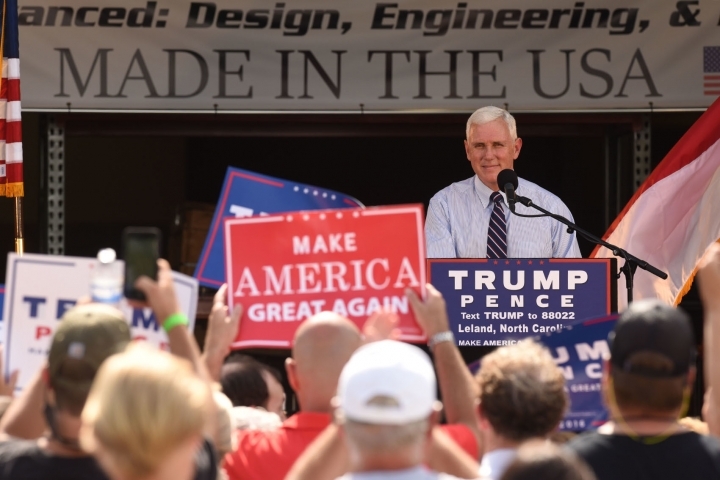 Pence spoke Wednesday at a rally in Leland, North Carolina. He repeated Trump's call for the Clinton charitable foundation to be closed and an independent prosecutor be named to examine the link between foreign foundation donors and her State Department work. Mike Pence has received a memento from his visit to a manufacturing plant in North Carolina, and it may end up around his dog's neck. 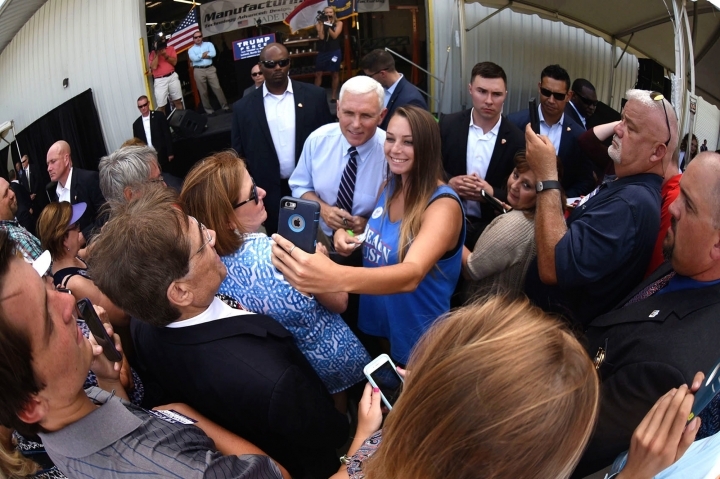 During his tour Wednesday of operations at Manufacturing Methods in Leland, workers presented the Republican vice presidential nominee, his wife and others with round metal key chains. The "Trump Pence" campaign logo had been cut into each of the trinkets with a machine that shoots water and abrasives at 50,000 pounds per square inch. Pence sounded impressed with the work, but told company employee Hunter Phillips that it might not show up on the ring for his car and house keys. Instead, Pence said, "I might put it on my dog." Sen. Bernie Sanders says he'll campaign actively this fall to send Democrat Hillary Clinton the White House. And he says he'll urge the supporters of his former presidential campaign to help Democrats take back a majority in the Senate. Sanders says he's leaning toward seeking re-election as an independent senator from Vermont in 2018. He turns 75 on Sept. 8. Sanders tells The Associated Press that one campaign stop will be a Labor Day breakfast in New Hampshire. He'll stump there for Maggie Hassan, the Democratic governor challenging Republican Kelly Ayotte for her Senate seat. He says he plans to campaign for Democratic House and Senate candidates in other states, too. Sanders calls Republican Donald Trump the worst presidential nominee he has seen in his lifetime. The National Rifle Association is making plans to help Donald Trump. The NRA's political victory fund has reserved about $2.7 million in TV commercials from the week of Sept. 5 through the week of Oct. 18, Kantar Media's political ad tracker shows. Most ads are set to begin Sept. 20. Like the Republican presidential nominee's campaign, the NRA is focusing on Ohio, North Carolina and Pennsylvania. The group also will advertise across the country. The NRA has been one of Trump's key allies on television, airing commercials well before Trump's own campaign began doing so. In all, the NRA is on track to spend at least $7.6 million on presidential commercials, Kantar Media shows. The NRA warns that Democrat Hillary Clinton would clamp down on gun rights if elected president. Donald Trump is again urging African-Americans and Hispanics living in inner cities to give him a chance. 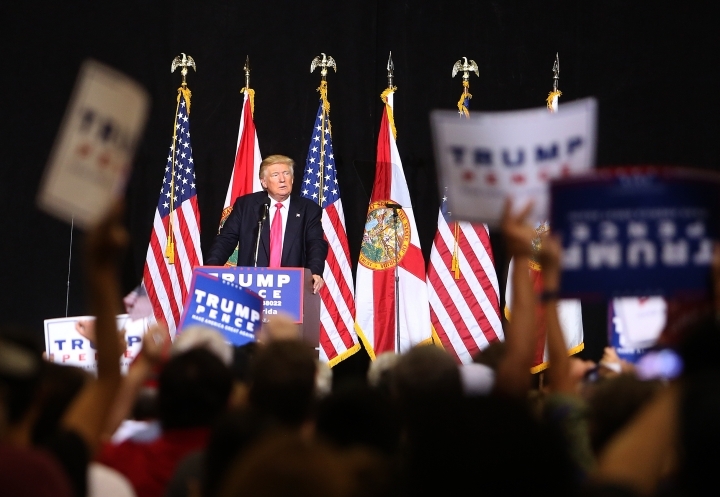 Speaking in Tampa, Florida, Trump said that Democratic policies have only led to more poverty, crime, and joblessness in cities like Chicago and Baltimore. He said: "To those suffering, I say, vote for Donald Trump," asking once again what they have to lose. Trump says that if he's elected, he'll make sure everyone can walk down the street without being shot. And he is telling Hispanics, "I want you to join the ranks of people who are making phenomenal livings." He said: "I think we're going to do great with African-Americans and with the Hispanics," despite polls showing the minority voters overwhelmingly favoring rival Hillary Clinton. Donald Trump is thanking volunteers who will be staffing one of three recreational vehicles that will crisscross Florida to register voters ahead of Election Day. Trump, the Republican nominee, hopped out of his motorcade in advance of a rally Wednesday in Tampa. 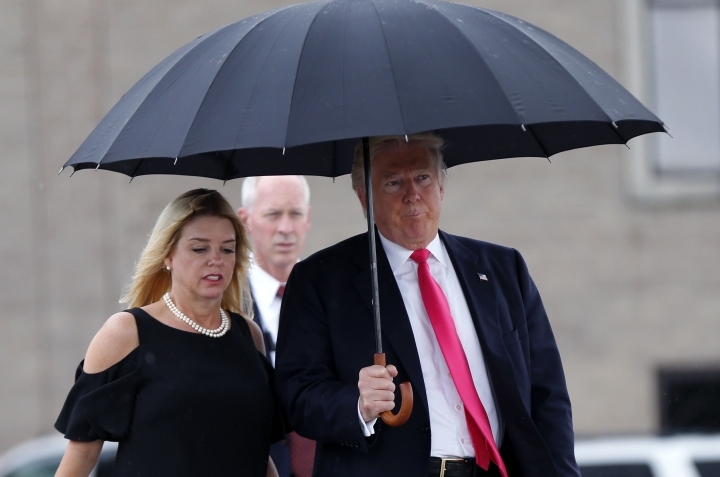 He arrived as a thunderstorm did, but was handed an umbrella and walked over, declaring "I have to see my people." He shook hands with volunteers, including Tony Ledbetter, a Republican official. He also saluted his campaign's recent outreach to minorities, saying "I think we're doing really great with minority voters." At the rally in Tampa, Trump is expected to discuss how his economic policies would help Hispanics. Then, as a heavy downpour began, Trump ducked inside the RV to shake more hands. Donald Trump is applauding the prospect of former Texas Gov. Rick Perry mounting a primary challenge against Sen. Ted Cruz in 2018, saying "boy, will he do well." At an Austin fundraiser Tuesday, Trump was asked about Perry trying to unseat Trump's former primary rival. On a recording of the event released by a Democratic group, Trump says he's been "hearing a lot about that" and isn't sure what Perry will do. But he calls Perry a "great governor" saying, "People love him in Texas." Perry left office last year and was once a Trump critic, but now supports him. Perry has told associates he's unlikely to run for Senate. Trump's comments, though, could be payback for Cruz refusing to endorse the billionaire businessman during last month's Republican National Convention. Republican vice presidential candidate Gov. Mike Pence is blaming both Democrats and Republicans for the decline of manufacturing in the United States. The Indiana governor was addressing about 200 people Wednesday at Charlotte Pipe and Foundry in North Carolina. He said policies by both Republican and Democratic administrations have eroded America's manufacturing industry. Pence also said the country has been neither smart nor tough in defending U.S. jobs from international trade. He said that will change if he and Donald Trump are elected in November. 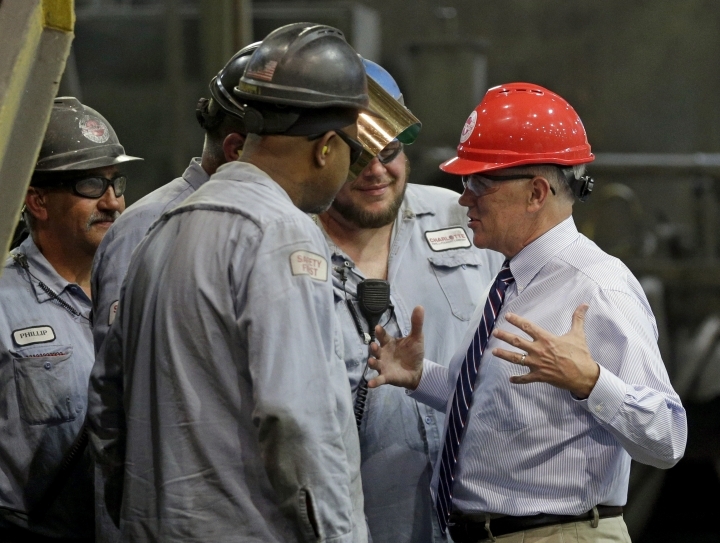 Pence, wearing a hard hat and safety glasses, toured the manufacturing portion of the plant, shaking hands with some workers. Donald Trump's new Wisconsin women coalition includes some of the most powerful politicians in the state, and two who were caught up in a highly publicized investigation into Gov. Scott Walker's county office. The unveiling of the statewide group Wednesday comes as polls show Trump trailing Democrat Hillary Clinton overall in Wisconsin and among women. Former Lt. Gov. Margaret Farrow, state Senate President Mary Lazich (LAH-zik) and Sen. Alberta Darling, co-chair of the Legislature's budget committee, top the coalition. Also part of the group is Darlene Wink, who was convicted of two misdemeanors for doing work on Walker's gubernatorial campaign while at work in his Milwaukee County executive's office. Another coalition member, Rose Ann Dieck (DIKE), was granted immunity to testify as part of that probe. Ohio's elections chief has cleared the way for Libertarian presidential nominee Gary Johnson to appear on fall ballots in the critical swing state. Johnson's ballot access had been in question after party activists submitted paperwork and voter signatures earlier this month on behalf of a different candidate. They said they planned to swap in Johnson. Republican Secretary of State Jon Husted (HYOO'-sted) has said Ohio law neither openly permits nor bars the switch, but he would allow it as long as elections boards validated enough voter signatures. Husted's office announced Wednesday that Johnson's supporters have met the signature requirements. Libertarians aren't recognized as a political party in Ohio, so activists sought to collect enough signatures from voters to get Johnson on the ballot by way of a process for independent candidates. A son of Donald Trump says it would be foolish for his father to release his tax returns. The Republican presidential nominee has broken with precedent by refusing to release them. He says they are being audited and he can't release them until the audit is complete. His son, Eric Trump, said Wednesday on CNBC not much can be learned from tax returns. He said his father's returns are massive and "you would have a bunch of people who know nothing about taxes" looking through them and making "assumptions on things they know nothing about." Democrats say Trump's returns would reveal whether he was paying a fair amount in taxes and whether he would personally benefit from his policy proposals. As the Zika virus continues to spread, Hillary Clinton is proposing a new fund to improve the federal government's response to major public health crises. 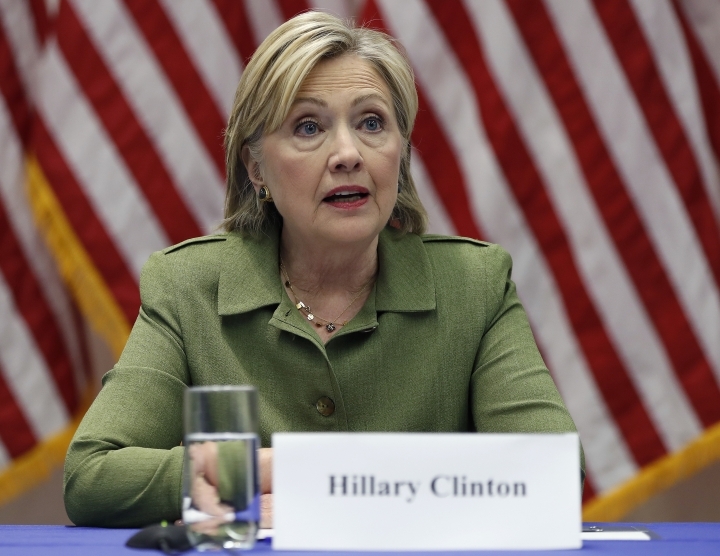 The Democratic presidential nominee says the U.S. is failing to sufficiently invest in public health preparedness, not only for Zika, but health threats from potentially pandemic diseases, climate change and possible bioterrorism. If elected, Clinton would create what she's calling a "Public Health Rapid Response Fund" to help federal agencies and local hospital systems respond faster and more aggressively. Her campaign did not detail the size of the fund, its annual budget or whether it would be paid for with other government revenue.